View of “Mai-Thu Perret: Sightings,” 2016. From left: Les guérillères III, 2016; Les guérillères VI, 2016. One’s first glimpse of this small yet powerful exhibition—an installation of eight life-size female fighters, a ceramic dog, an enormous Rorschach-like painting, and two oversize sculptural eyes—is through a glass wall that Mai-Thu Perret has smeared with petroleum jelly. Fittingly, and elegantly, the viscous salve on the manufactured surface initially makes the contents of “Sightings” an alluring mystery. Once visitors pass through the glass to mingle among “Les guérillères” (The Guerillas), 2016—comprising the female figures and their dog, each subtitled I through IX and inspired by female Y.P.J. Kurdish resisters—an uncanny confusion occurs between the inanimate and living. The soldiers are convincing, and not: Their wigs and military garb show no signs of wear, guns are cast in candy-hued translucent resin, and body parts are made of varying materials. Les guérillères V, with ombre shoulder-length hair and endearing polka-dot socks, crouches realistically, though her gun is purple and her flesh is made of woven wicker. 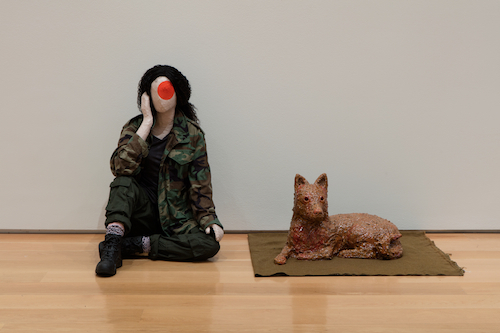 Les guérillères III sits wearily, head in hand, by the ceramic dog named VI—ears alert yet eye sockets empty—but her lumpy papier-mâché skin annuls any suspicions that she lives, as does the painted orange circle obscuring her face. Les guérillères VIII’s silicone body stands tall in the center of the room, her raised hand a suggestion that she might be leading this army. However, what commands our attention is on the gallery’s back wall. There hangs the thirteen-by-ten-foot painting on carpet, titled Agoraphobia I, 2016. Blotches of blood red overshadow skeins of grays and yellows, saturating the fleshy fabric. Is this a splayed body, a torn flag? The work demonstrates Perret’s skill in using charged material to produce objects and environments that attract and repel, vibrating on the edge of life.